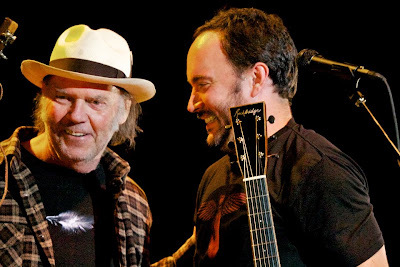 Here's the Photo of the Moment of Dave Matthews & Neil Young at Bridge School Benefit Concert 2011. Dave Matthews & Neil Young played "Oh! Susanna" together in one the concerts many highlights. More on "Oh! Susanna" - Dave Matthews & Neil Young - Bridge 2011 Concerts - October 23, 2011 - YouTube. It looks like tickets are still available for Lineup for 2012 Bridge School Benefit Concert . still one of my all time favorite performances! pure americana. sorry, missed that one. dave matthews at bridge=beer and piss break. This is also one of my all-time favorite Neil performances. One I'll never tire of. Pure magic and creative genius. Daves always buzzed at BSB shows. Still his, Reynolds, set was best of the day. No real competition. Best of, "Bridge School Concert" is on NOW on PBS!